I always find that as winter creeps in, boots are the only practical choice. Whilst I recently bought a nice black pair, I’m finding that if I want to wear my boots with something brown they just don’t look right. 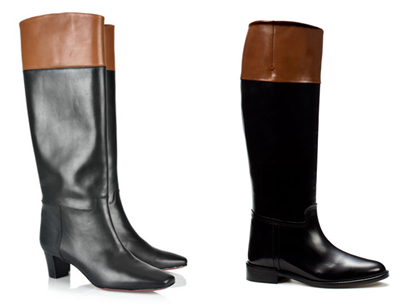 In the same way, brown boots when worn with black, is equally difficult, unless you get the right shade. I love the two tone effect of these boots, and other than the fact that they’re Louboutins (left), the Zara pair (right) are not only more affordable, they’ll look better as they age and they’re flat so they should be super comfy. Hmmm I had a quick looksee at the shop and they’re v v taste specific, unfortunately not totally my taste other than one or two pairs!